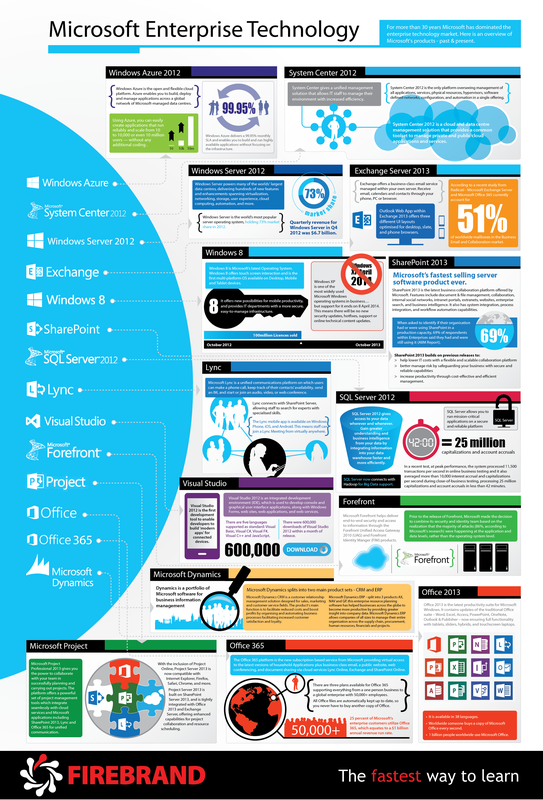 Microsoft have been creating and launching leading business and enterprise technology for more than 30 years. In response to Microsoft's release of new flagship products SQL Server 2014, Windows Server 2012 R2 and System Center 2012 R2, we decided to create a comprehensive guide to Microsoft's full range of technology. After pondering several formats and seeking out some crack designers we settled on an infographic as the best way to display the information. Check out the graphic below and let us know your thoughts. If you want to see a super-size version you can also find it on our website. Hopefully once reading you will know about the full range of enterprise and business technology available from Microsoft. Whether it be email communication, project management, website development, customer relations management, security, live chat or data storage, management and insight (the list goes on) .....Microsoft have a product for you. Special thanks goes to Ashley Petrons and Bill Farmer from Hutt River, who were integral in the design and launch of this graphic.